Hi Sue. Have you always liked writing? No, in fact I hated writing when I was at school. Back then, few people had heard of dyslexia, computers were the size of walls and elderly relatives were often scared of telephones. As a child I had to write lots of thank you letters and if they were spelt wrong or your handwriting was untidy you just had to keep writing them again and again. Later on computers became my friend. If things went wrong you didn’t have to start again and they had a spellchecker. Not perfect, but better than me. I wrote my first poem when I was eight on the back of a postcard. I wrote the same poem on all my postcards that year. My aged relatives really seemed to like them and it was so much easier and more fun for me than writing a long boring letter about the weather and what I’d been doing. When I was little my Dad used to recite poetry to me at bed times. I loved the rhythms and the sounds of the words and I felt I wanted to make words sound like that. The first adult poem I fell in love with was ‘The Thought Fox’ by Ted Hughes. The fox is really the idea in the poet’s head and the footprints he leaves are the finished poem. I remember thinking that it was the most beautiful thing I had ever read. I think also I liked writing poetry because I found it didn’t need as many words as fiction, just the best, most powerful ones. Of course the fun part is deciding which ones are the right words. Much later on I began writing poems and illustrating them for my children. Then one day I went to my local library and met a poet called Nick Tokzec who put two in a book. I was so excited about this that I put the milk in the dishwasher. I suppose that that was the first time I had really thought of myself as a poet. I’ve had lots of poems in anthologies but Where Zebras Go is my first solo collection. I’m really pleased with it. You have illustrated the book yourself. This is quite unusual isn’t it? How did it come about? Yes it is unusual. And it was by no means certain that I would be allowed to, even though I have illustrated other people’s books. I had to put in samples just as any other illustrator would do. 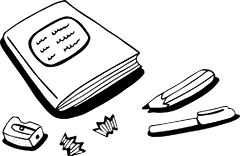 Publishers have artists they like, and whom they work with regularly. Happily, Janetta Otter-Barry, my publisher, was very supportive and felt that having the poet’s illustrations might actually add something special. to the book. I was also allowed a lot of creative freedom. For me, having illustrations that reflected the mood of the poems was vital. It would have been hard to re imagine them with someone else’s illustrations. I have been so very lucky in finding someone who felt the same way. There is no one answer to that. The longest time I’ve spent writing and rewriting a poem was seven years but sometimes it only takes me a few minutes to get the main ideas down. Usually, I have to work to deadlines set by publishers and editors though, so I write every day so that when I get asked for poems I already have something. You write a lot of shape poems. What is it that you enjoy about doing these and how long does it take? I think because I also illustrate, it’s a way I can draw with words. Sometimes when I’m writing a poem a picture will jump into my head and then I will begin to wonder if I can make these words into something recognisable. It doesn’t always work first time and occasionally many more times. But I do love doing them and children particularly seem to find them fascinating. It may take two or three days to get them right even if it is going well. Also, just like the poetry itself, I tend to put them away for a while so I can forget and then see them as the reader might. It also helps if someone else reads the poems, because that’s really the only way to tell if they work fully. What is the most unusual thing that has inspired you to write a poem? Recently I wrote one about my ancient grumpy fridge. Some days it pretends it’s a freezer and I have to defrost my supper before I can cook it. On other days it pretends to be a rocket taking off, by shaking noisily and jumping up and down. One evening I started thinking about all the reasons it might have for behaving badly or sabotaging my food. Maybe it wished it belonged to a celebrity chef or perhaps it just hated being a fridge. Then I wrote a poem about it. How do you write poems? 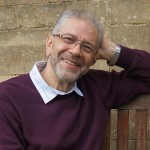 Is there a special time when you write? No not really, I write poems anywhere and everywhere. I write them down quickly before they have a chance to escape. I never really know when one will sneak up on me, even in the middle of the night. I always keep writing paper and pens in the upstairs loo so as to not wake anyone else up. I do this because poems often escape on the way downstairs. I also find that some of my best ideas arrive as I’m waking up in the morning so I keep a pad by the bed just in case. In fact, I once thought of a really brilliant poem, no honestly the best one I’ve never written, whilst walking along the street. Sadly, it got away before I made it back to paper. So now I have an emergency poem kit in every coat and bag just in case. Yes but it’s top secret. Yes I love to visit schools and inspire children to write their own poems. Particularly those children who don’t really enjoy writing. I think it helps children to know that even adults sometimes find writing hard but having good, original ideas is what’s most important. What was your most memorable day as a poet? Perhaps my most surreal day was when I discovered that one of my poems had made it into same book as The Thought Fox, the very poem that first made me want to be a poet! I don’t believe my fourteen-year-old self would ever have believed that could happen. The one I’m working on at the time usually, although it can also be the one I used to hate the most. Writing poems is like that and sometimes you are near to throwing one away and then days or even months later you realise that it’s a really good poem. The lesson I’ve learned is never to act in haste where new poems are concerned. I have two spaniels called Bayliss and Ruby. I love walking in the countryside or on the beach with them. I also have a cat called Dobby who likes to sit on my computer. He’s a very fast typist but his spelling is worse than mine. Keep a notebook and write down your ideas however silly they seem. Remember sometimes the silliest ideas become the best poems. Write a little every day. Read, read and read some more. All the best writers of any kind learnt their craft by reading the work of those who wrote before them. Read your poems to other people, anyone who will listen. Read them out loud to the mirror. Listen to how they sound, sometimes you can only tell if they work by listening to how the words sound. Put them away and do the same again later. Keep writing and enjoy it. 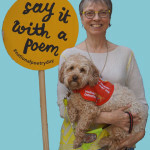 Sue Hardy-Dawson is a Yorkshire born poet, artist, and illustrator, and has been widely published in children’s poetry anthologies. Before becoming a poet she had worked with children for over twenty years. 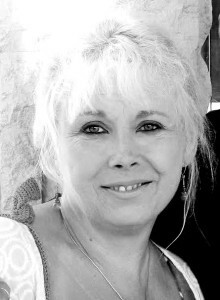 In 2014 she was highly commended for the Manchester Writing for Children Prize. She has an Open First Class Honours Degree in Creative Writing, Literature and Supporting Teaching and Learning. When not writing or drawing she likes to visit schools and also been commissioned to provide workshops for the Prince of Wales Foundation for Children and the Arts. She is dyslexic and takes a special interest in encouraging reluctant readers and writers. 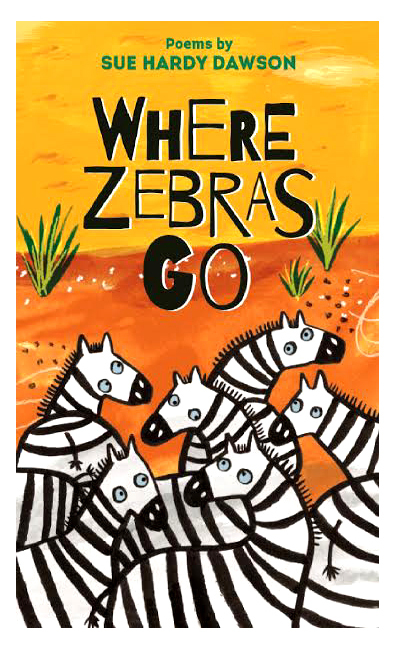 What reviewers have said about Where Zebras Go.